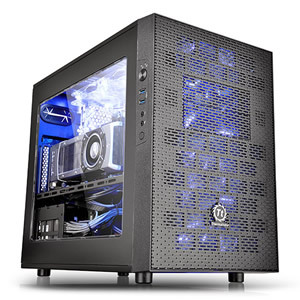 Core X1, the first ITX chassis of the Core X Series presented by Thermaltake, is a cube case offering endless stackable capacity and expandability for enthusiasts to create massive liquid cooling systems, utilize as a file server as well as accommodate dual systems. Users can customize the chassis for the best viewing presentation with an interchangeable window and I/O panel design. The Core X1 delivers outstanding cooling performance with compatibility for extensive DIY/AIO LCS and overclocking components, further enhancing the reputation that the air-cooling units of this series has become renowned for. It is guaranteed to be an immensely powerful system! With its endless stacking design, the Core X1 is in a class above the rest. Virtually limitless utility is possible; it offers an expandable system allowing enthusiasts to incorporate externally-modular upgrades. 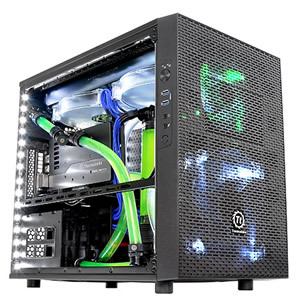 Stacked together, the chassis opens up space to expand the liquid cooling system, the storage solutions, or even create dual systems, thereby enabling a dedicated top/bottom setup for pure cooling. When stacked, the maximum radiator length supported is 540mm on the front side. Designed for high-end gaming system compatibility, the Core X1's modular drive racks allow gamers to easily install up to six data storage devices with triple PCI configuration space. VGA of up to 400mm in length, and a tower CPU cooler as high as 200mm. 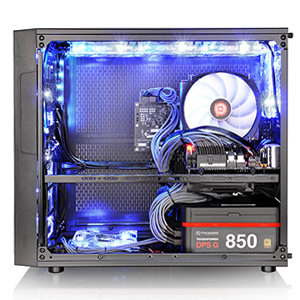 Even with a high-wattage PSU stretching to 220mm in length, it still leaves plenty of space for cable management. The Core X1's unparalleled cooling ability offers fan brackets with various mounting points to support any type of gaming system that can be accommodated, including DIY/AIO liquid-cooling systems and air-cooling units. Two 120mm fan are pre-installed on the front and rear to reassure and guarantee the flow of aeration. The fan brackets can either be adjusted for 120mm, 140mm, or 200mm fans on the top panel. 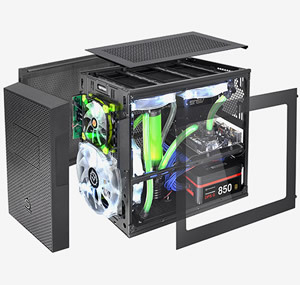 Optimized for space management, the Core X1 is divided into two main chambers: the upper chamber is made for cooling performance and better efficiency, while the lower one is made for PSU and drive bays. 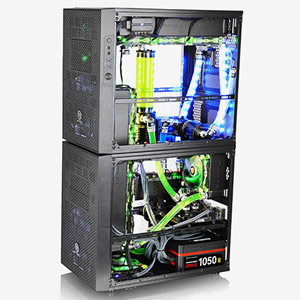 Thanks to the removable 2.5"/3.5" drive device racks, there is plenty of flexibility to gain the maximum interior space when needed for advanced cooling performance or liquid systems build. A "2+4" drive bay concept design for storage devices makes setup super easy and flexible. In addition, a customizable 5.25" & 3.5" drive bay feature enables users to freely interchange the 3.5" hard-drive cages to suit their particular needs. Height 502mm / 19.8" 465mm / 18.3" 526mm / 20.7"
Width 380mm / 15" 320mm / 12.6" 232mm / 9.1"
Depth 640mm / 25.2" 541mm / 21.3" 491mm / 18.5"
Internal Drive Bay 6 x 3.5"/2.5"
1 x 3.5", 2 x 2.5"
(M/B Tray) 4 x 3.5"/2.5"
External Drive Bay 3 x 5.25" 3 x 5.25" 2 x 5.25"
16.80" x 11.00" x 18.50"
Pros: the case itself, is mostly solid, however, there are some plastic its that came snapped, in transit before i could even use them. Cons: all four plastic legs were broken off, and were shipped like this, and the screws holding the front IO on the case, were all overtightened, and were snapped off. 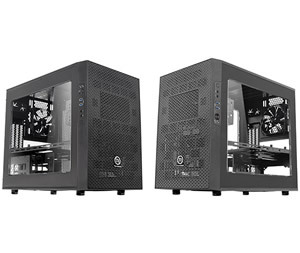 If you'd like, you can contact us through our Thermaltake USA Support site so you can find out how to get those replacement parts instead of having the entire case replaced. Pros: Super good on air flow. One 200mm is all it needs. Cons: Too bad it size is little big, not fit in a tight area. Other Thoughts: The ugliest material used for the plastic feet. Broke one within 20 days after purchased. Will replace all with cheap rubber feet from $0.99 market. Pros: Case arrived in two working days. Box had one small ding (see below). Case arrived almost in perfect condition. 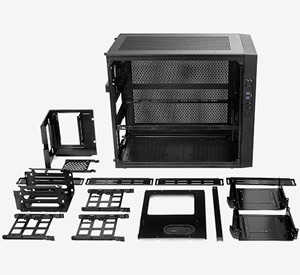 It looks like a great case I can hardly wait to build my new MITX build. Cons: Apparently that one ding was enough to tear the plastic bag holding the screws so some items fell out of the bag, very minor not worth two eggs. But at the bottom of the case were two broken feet. The box looked fine. So I took one egg per foot. I know too heavy a price. But it is a new case after all, not used. So lets call it 3 and 1/2 eggs. And yes I hold Newegg to a high standard than most companies. That is why I use them for all or my builds and all my customers builds. First time I did not give them 5 eggs. Other Thoughts: Looking forward to buying more stuff from Newegg in the near future. After all I need to complete 4 PC's over the next 30 days. Please contact Customer Support to obtain RMA instructions and have the two feet replaced through warranty. Pros: Plenty of space. Customizable. Fits large fans and radiators. Cons: Some might think its too big for a mini-itx board (its larger than a standard atx case) but i think it works well. Other Thoughts: In my opinion its an eggstremely good buy, I've had it for over a year and its held together strong. The windows is nice too. Pros: This case is amazing. It has room for anything you could fit into a mini-Itx build. Filters along all sides besides the one with the window. 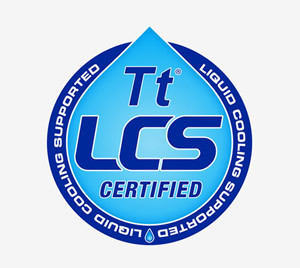 Great for airflow, ideal for a liquid cooling solution (which I took advantage of). Fan mounting above is entirely adjustable and removable as desired. Cons: Cable management is tough- the open space makes it difficult to find space to tuck wires. Pros: Room for water cooling. Big closed loop CPU coolers. Large window. Mini ITX case, customization isn't endless because it Mini ITX, but pretty dang close for Mini ITX. They're isn't other Mini ITX case out there that lets you do this much stuff. 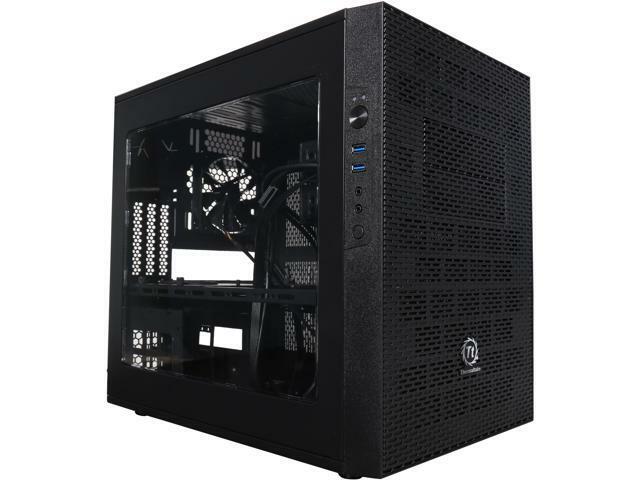 Sorry, CaseLabs... but this case is so inexpensive. Cons: It's big, really big. it's the size of a mid tower case.